Everest has been climbed over 5000 times between now and 1953, when it was first conquered by Edmund Hillary and Tenzing Norgay. The British expedition which they were members of approached the mountain from Nepal. Having found their way through the deadly maze of the Khumbu Icefall, stood the exhausting trial of Lhotse Face and, on summit day, having overcome the difficult rock step now named after Hillary, the New Zealander and the Sherpa reached the top of the world. In doing so they inaugurated the route to the summit of Everest which is now followed by hundreds of climbers, one which is only rivaled in popularity by the Northeast Ridge route on the Tibetan/Chinese side of the mountain – the one I intend to follow. In this post I will briefly relate the first chapters of its history. I will also write about what I consider the greatest personal challenge of the climb and the biggest advantage of undertaking it from the Cold Side. Ever since the Great Trigonometric Survey (1856) determined the summit of Chomolungma to be the highest point on Earth, the Himalayan peak began to attract a lot of attention – and its first potential conquerors. The British, who’d conducted the survey and [re-]named the mountain Everest, wanted also to claim the first ascent. Given that Nepal was then a kingdom closed to foreign visitors, approaching Everest from Tibet was the only option. The expedition of 1921 had reconnaissance as its declared objective but, with Britain’s top climbers, including George Leigh Mallory, among its members, it may have hoped for more. 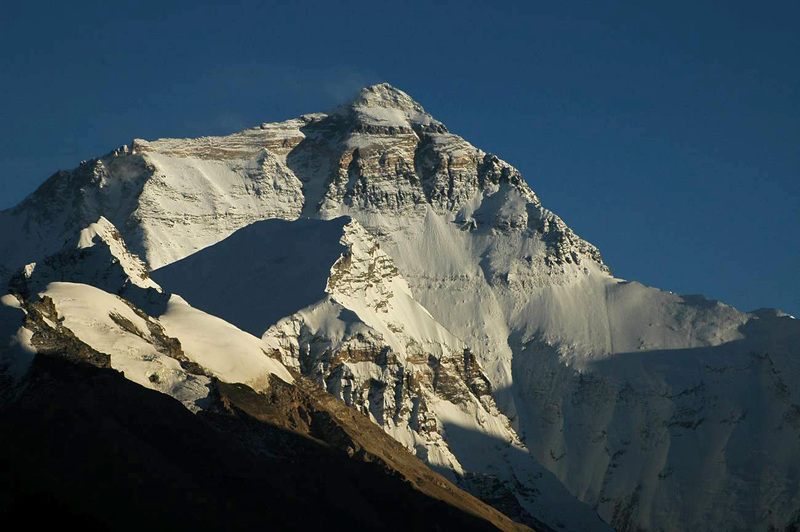 The expedition’s main goal was achieved: the approach to Everest was found, as were many sections of the route to the summit, and some weather patterns, relevant for climbing, were noted. Thus, it was hoped that the climbing expedition to follow should reach the summit. Unfortunately, a set of inauspicious circumstances prevented George Mallory and the climbers of the 1922 expedition from doing so, and another attempt was imminent. It was launched in 1924, once again bringing Mallory and the top British mountaineers of the day to Tibet. A relative novice to climbing, Andrew ‘Sandy’ Irvine, was also on the team. Mallory and Irvine, along with Hillary and Tenzing, are four names that have become almost synonymous with Everest itself: the latter pair – because they were the first to climb the mountain and return safely, and the former – because, using the equipment available in 1924, after a long time high in the death zone, they may have climbed the mountain. But, they never returned. On their summit day, Mallory and Irvine disappeared out of sight in a cloud on one of the rock steps barring the way to the summit, and with this ‘vanishing’ a great mountaineering mystery was born. Did they conquer the summit and perish on the way down, or did they die retreating, having failed to overcome the very formidable obstacle of the Second Step? Is it possible that Mallory’s skill and Irvine’s commitment could have helped them to the top of the infamously difficult, exposed rock step, which many great climbers of today would struggle with, modern equipment and techniques notwithstanding? To put things into perspective, there is now a ladder where Mallory and Irvine had to have climbed wearing hobnailed boots, gabardine pants and cumbersome oxygen apparatuses. Regardless of whether or not they reached the summit, it is in the footsteps of these men that I would like to to follow. It may be that their path not merely leads to the top of the world but goes beyond, into a realm, where it is the mind – not the body or the external forces of nature – that determines what is possible. No living guide would take me to that place, so I must follow ghosts. Now, that sounds romantic, non :)? It won’t be. The Northeat Ridge route up Everest is no lovely, meditative walk in the park. It is a route that is more difficult and, statistically, more dangerous than the climb from Nepal. After a dusty four-/five-day drive from Kathmandu to the Old Chinese Base Camp in the province of Tibet one arrives at the foot of Chomolungma. Having spent a few days acclimatizing at BC at 5200m, climbers then start for the mountain, where they must pass its many and varied tests before they can hope to reach the top. One of the main difficulties on all of Everest, but especially the North Side, is the cold, made worse by tireless winds. If you think it’s easy to manage with layers (and layers, and layers, and layers) of warm clothing, it’s not quite that simple. At high elevations blood does not carry nearly as much oxygen as at sea level; it is ‘thinner’, and the circulation – slower and less efficient. Thus, the body does not produce enough heat to warm up the clothing, no matter how many layers of it one may be wearing. Being well-acclimatized helps deal with altitude-related issues, including the cold: overtime one’s blood ‘learns’ to transport more O2 as it tries to make up for the lack of it in the air. However, the human body can only do so much to adapt to and fend off the detrimental effects of the cold, hypoxic environments of high mountains. When the cold becomes extreme, the body switches to ‘survival mode’: it ‘gives up’ parts of itself that are not crucial for survival – that is how fingers and toes (and extremities in general) are lost to frostbite. Therefore, the cold and ways of managing the risks it presents must be considered seriously before any extremely high climb. For me, the cold is a very real problem. It appears that the same ‘eccentric’ thermal regulation system that allows me to swim in ice-cold water safely, can harm me in cold air. Whereas it is beneficial for ice-swimming to allow a layer of one’s flesh to ‘freeze’ as quickly as possible (so as to slow down further loss of bodily warmth and protect the rest of the tissues from cold), it is dangerous for mountaineering, where one spends extended periods of time in arctic temperatures. The danger here is that my body may mistake a five-day summit push for a thirty-minute ice-swim: it may rashly surrender more tissues to cold than it will be able to re-heat before they die permanently. Of course, all this may be ignorant speculation but, having observed my body’s reactions to extreme cold on many occasions, in both water and air, this is the conclusion I’ve drawn. And so, perhaps, wrongly, I worry more about the cold than I do about the long, exhausting climbing days and the technical difficulties of the Mallory route. Then, why have I chosen to climb from the Cold Side? Because, paradoxically, my choice could make for a warmer summit day – naturally, the longest and coldest of all the climbing days on Everest. How? Let me explain. The North side has always been somewhat less crowded than the Southeast Ridge route in Nepal, especially, in recent years. There’s a number of reasons for this, and one of them is that Tibet is not always open for expeditions. Many commercial companies no longer try to work there at all: to avoid the disappointments and losses associated with having to switch to the Nepal side if Tibet is closed without early warning, which has happened in the past. Given that permit prices are now exactly the same, there’s no longer any financial benefit – as there used to be – to climbing from the Cold Side. However, from my selfish perspective, there is a very positive aspect to this development: the Northeast Ridge route will not have half as many climbers pulling on that single fixed rope as the Southeast Ridge route will. Crowds may not be such a great hindrance to one’s progress lower on the mountain, but on summit day they may and they will. The The South side is notorious for ‘traffic jams’ high in the death zone, where the cold is bitter, the wind – wild, and the danger of suffering frostbite increases with every minute spent without moving. Although on the North Side, too, there is usually quite a few people under and above the Second Step on summit day, they are not as many, and so the wait in the cold ought to be shorter. That, at least, is what I think the case is. Unfortunately, all too many things may yet happen to prevent me from joining a summit day traffic jam on Everest. I can only hope that the Cold Side proves more welcoming than the name by which I’ve been calling it suggests. Very interesting history and background information…it helps set the perspective for the climb…thanks.